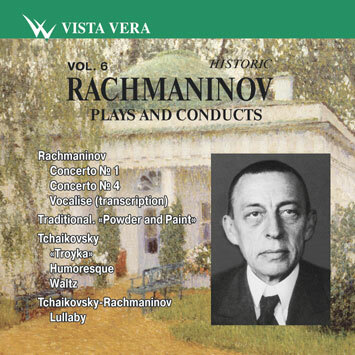 Here on this Russian Vista Vera disc Rachmaninov is heard as pianist, conductor and accompanist to the mezzo-soprano Nadezhda Plevitskaya in a rare recording of his arrangement of the haunting folk song, Powder and Paint. Rachmaninov's recordings of his concertante works are legendary and in performances with Eugene Ormandy and the Philadelphia Orchestra from the 1940s of his First and Forth concertos, Rachmaninov displays a classical overview of their structure, phrasing and line. He plays lyrical passages with a beautifully full rounded tone quality while the virtuosity - especially in the First Concerto's main cadenza and the Allegro vivace finales of both concertos - is awe-inspiring. The selection of Tchaikovsky miniatures is delightful, Rachmaninov bringing his genius and musicianship to bear on these salon pieces, turning them into little gems. His own arrangement of Tchaikovsky's Lullaby is simply magical. Although these recordings date from 1920s, 1930s and 1940s, the transfers are excellent with little or no surface noise. The Concerto performances are still the fons et origo for pianists, which they must either internalise, absorb or reject. The performances demonstrate, by their compelling control and sense of architecture, just how to release those moments of romantic effulgence that most pianists spend their lives sentimentalising. It was a musical gift his poker faced compatriot and colleague Moiseiwitsch absorbed and that Rachmaninov so admired in him. Stokowski is an adept marshal in the Second - that glorious Philadelphia string cantilever in the first movement, the wind counterpoint in the slow movement. Then there are those lessons in weight and rhythmic control in the finale - the naturalness of propulsion that was so inherent a part of his musical mechanism. Then there's the sheer savoir-faire of the Paganini Variations, the lissom drama and nobility enshrined within. The First Concerto similarly has the most acute sense of direction, drama and lyricism held in perfect balance whilst the famous Fourth's tempestuous drive is nevertheless accompanied by the unravelling of the beautiful wind writing (in Rachmaninov's performances time becomes elastic).